We have some punkin chunkin to do! If you're wondering what the heck I'm talking about, then maybe you should plan a visit to the Yankee Farmer on Route 31 in Greenfield, NH. We learned about the farm on a whim this morning and decided to take a short drive out there this afternoon to watch some pumpkin throwing. We drove about 10 miles down a pleasant but deserted country road before coming upon the Yankee Farmer -- a nice New England farm stand with a twist. Farmer Steve Seigars and his family operate a trebuchet, the oldest type of catapult known to man. They use this impressive machine (more than 50-feet high) to launch pumpkins into a hillside. But there's more...this is a worldwide competitive sport and the Seigars currently hold the world championship record throw of 1,658 feet! This was all new to me, but apparently not new to the rest of the world. There were about 150 to 200 people milling around the hillside waiting to see an 8 to 10-pound pumpkin sail through the air. What a fun way to spend time outdoors on a beautiful fall day! 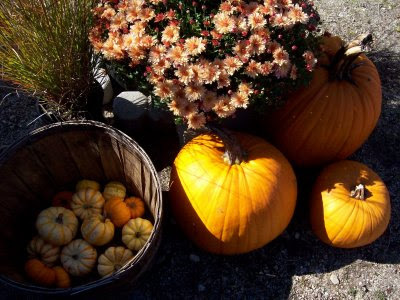 Not to mention there are lots of great pumpkins, apple cider, home-baked bread, an ox-driven cart (and more!) at the Yankee Farmer. The pumpkins fly each Saturday and Sunday afternoon between 1:00 and 5:00 p.m. until October 25th. Check out the Yankee Farmer website for directions and more details. We saw an orange pumpkin hurl through the air today, but I learned that competitive "chunkers" (that's what they call themselves) generally use white pumpkins, but not just any old garden variety white pumpkin. The Lumina is much-preferred for its smooth skin, spherical shape and density. Who knew? For me, punkin chunkin is one more reason to love New Hampshire! We biked a portion of the Minuteman Bikeway yesterday, starting in Bedford, and passing through Lexington and Arlington. 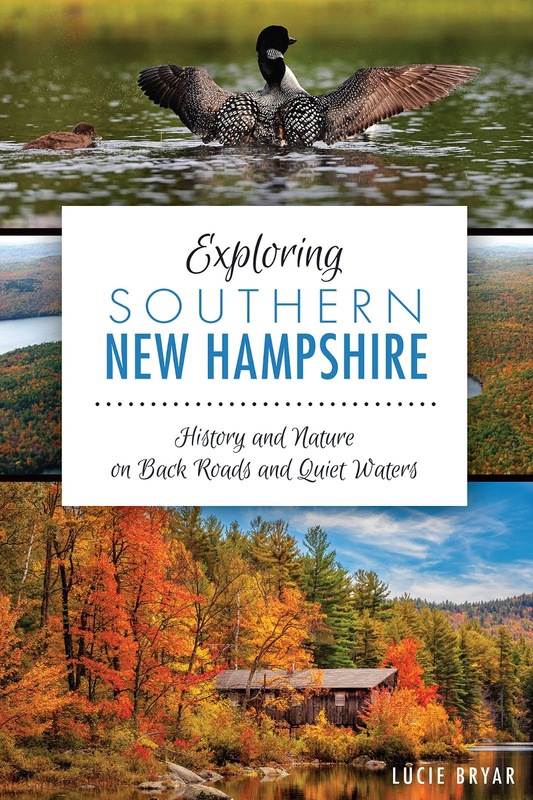 Yes -- it's in Massachusetts, not New Hampshire, but it's only about a 35-minute drive from us. This bikeway is in the Bike Trail Hall of Fame. The entire 11-mile trail spans from Depot Park in Bedford to Alewife Station in Cambridge and is heavily used by bicyclists, joggers, inline skaters, and walkers. It's 12-feet wide, paved, and mostly flat, making for easy biking. We've visited the Lexington Battle Green before, but it's always interesting to see. This is the actual spot where the American Revolution began in 1775. 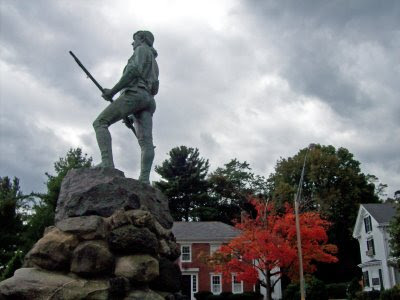 There's an impressive Minuteman statue, a Revolutionary Monument (where the colonists who lost their lives are buried); a historic tavern; and nearby, the Old Burying Ground with gravestones dating from 1690. Well worth a detour from the bikeway! The rest of the bike path was mostly tree-lined, passing fairly close behind homes, shops, and factories. Given the bikeway's close proximity to the towns of Bedford, Lexington, and Arlington, you have several options for lunch or a break. There's even access to a StarBucks from the trail. Compared with other rail trails we've been on, this one crossed many more roads, including above busy Interstate 95. As we approached mile seven, it started to rain, so we turned around and headed back, riding the last two miles in a chilly rain. I'd recommend the Minuteman Bikeway if you want an easy ride and you enjoy American history or at the very least -- a pleasant stop in a beautiful New England town green. Things to Know Before You Go: The best source of information can be found on the official website, http://www.minutemanbikeway.org/. To find directions quickly, select "Bikeway Basics," and then "maps."